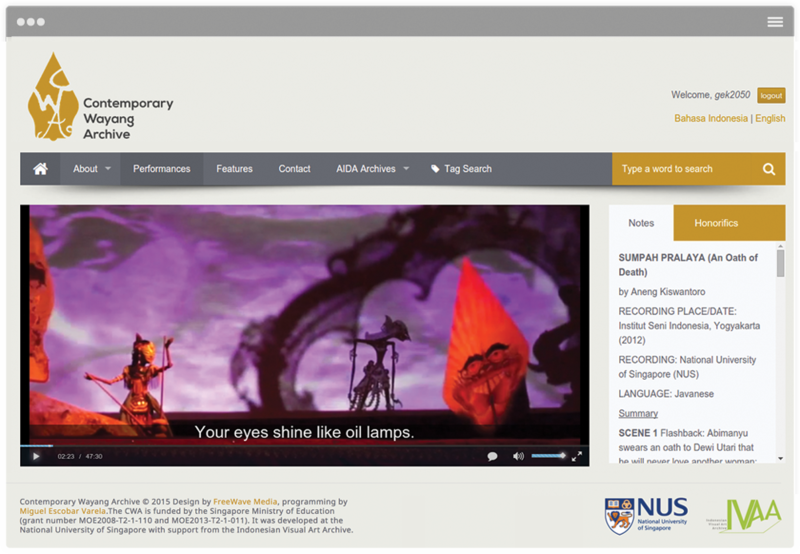 The Asian Intercultural Digital Archives (AIDA) is a group of digital archives of East and Southeast Asian performance materials based at the National University of Singapore. AIDA focuses on the interculturality both of performance practices in the region, and of archiving practices through which performances may be enjoyed and studied by viewers within and beyond the region on the internet. 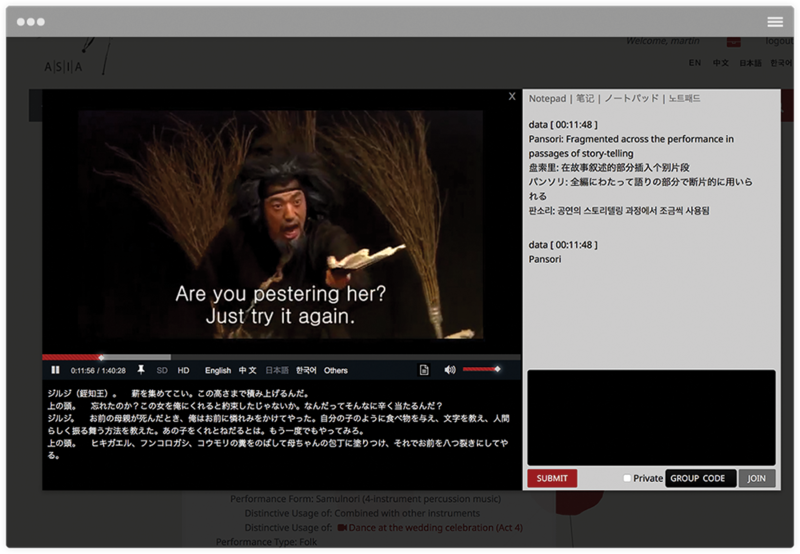 AIDA originated in 2007 with a group of scholars from Japan, Singapore, South Korea, Taiwan and the USA who began the Asian Shakespeare Intercultural Archive (A|S|I|A). In 2009 A|S|I|A became part of the research project, Relocating Intercultural Theatre, led by YONG Li Lan, which was awarded a grant of S$850,000 by the Singapore Ministry of Education Academic Research Fund (MOE2008-T2-1-110). The project’s aim was to re-situate the critical debates on intercultural performance from perspectives within the Asian region, using several concurrent modes of research: digital archiving of Asian Shakespeare performance (led by the A|S|I|A partners); academic research on Asian Avant-Gardes (led by Paul RAE); and practice focussing on everyday life, of which National Language Class, directed by Paul RAE, was one outcome. The second phase of the research project focussed on developing best practices for the digital archiving of intercultural performances. Digital Archiving and Intercultural Performance (MOE2013-T2-1-011), led by YONG Li Lan, was awarded a grant of S$716,000 in 2013. This phase completed the A|S|I|A interface in four fully equivalent parallel languages, and launched two new archives: the Contemporary Wayang Archive (CWA), led by Miguel ESCOBAR, and Theatre Makers Asia (TMA), led by Alvin LIM and TAKIGUCHI Ken. In this phase the archive teams also began collaborations in online teaching, and published numerous essays on the archived performances, on digital archiving and on translation. 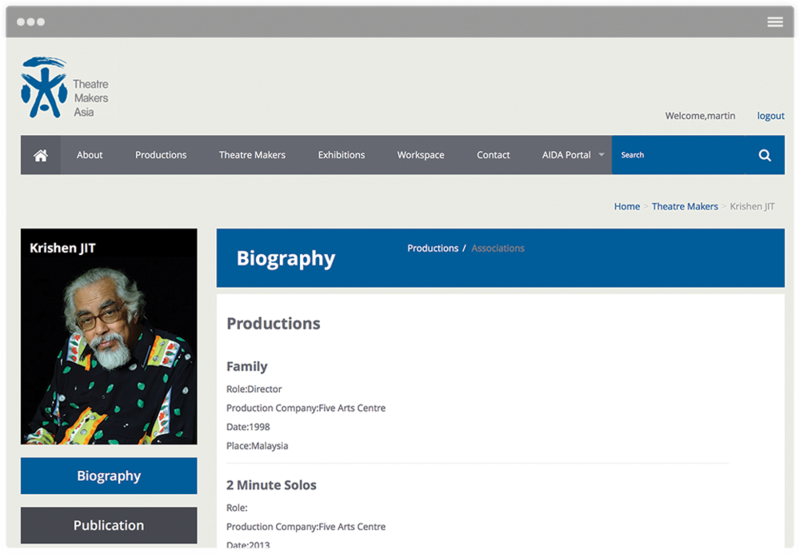 AIDA leads in developing performance archiving tools and platforms for comparative studies, theatre histories, translation and performance analysis. By attending to the cultural specificities and contexts of intercultural theatre and performance in East and Southeast Asia, AIDA also aims to provide the basis for informed and comparative encounters of intercultural productions, re-elaborations of traditional forms, and theatre collaborations between practitioners. The A|S|I|A website itself represents an exploration of intercultural practices for the digital archiving of performance. Its four parallel language environments are fully equivalent throughout, and users can switch between them at any time. 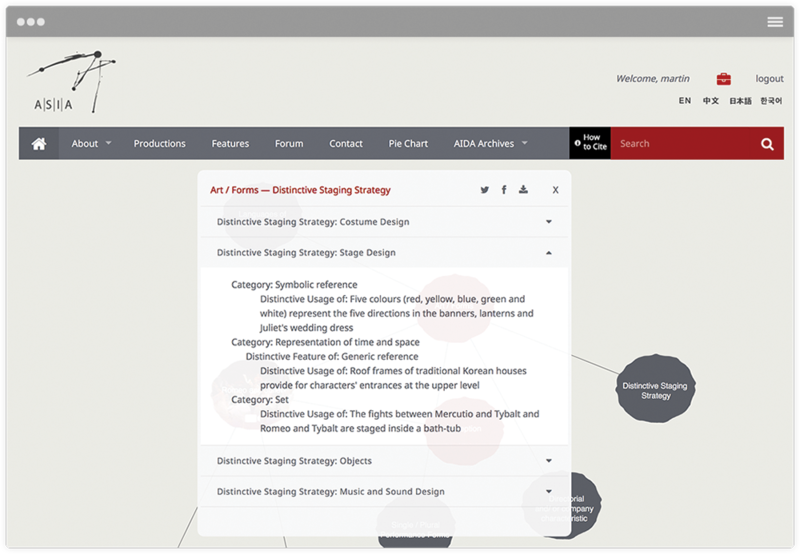 This design enables archival research in a single language, which is at the same time porous to and interactive with accompanying positionalities in the other languages. The integration of languages, and thereby language communities, within a single domain corresponds to and expands the intercultural performativity of the original productions, as well as of the communities who create, watch, archive and study them. 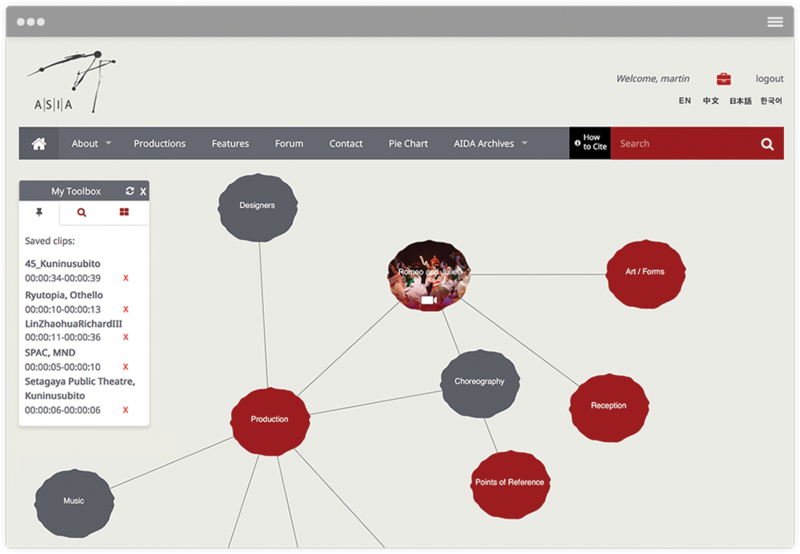 Tools for facilitating the use of the archive’s materials in presentations, online learning and user interaction are under continuous development. A|S|I|A 는 셰익스피어 공연을 디지털 아카이브화시키기 위해 상호문화적인 탐구를 제시하고 있습니다. 네 가지 언어는 동등한 맥락에서 사용자들에 의해 언제든지 전환되어 사용될 수 있습니다. 이러한 체계는 단일한 언어로 아카이브 연구가 가능하도록 하는 동시에 다른 언어들 사이의 동시다발적이면서도 상호작용이 용이한 연구환경을 제공합니다. 하나의 영역 내에서 언어들의 통합, 즉 언어 공동체는 공연뿐만 아니라 이를 만들고 감상하고 아카이브화하고 연구하는 공동체의 상호문화적인 수행성에 상응하며, 또한 이를 확장시켜 나갑니다. 아카이브 내의 공연, 온라인 학습, 그리고 사용자들의 대화에 있는 자료들을 사용하기 위한 도구들은 지속적인 발전 단계에 있습니다. Theatre Makers Asia (TMA), aims to examine and experiment in the possibility of digital archives as a platform for collaborative research on and creative responses to works that marked milestones in the history of contemporary theatre in East and Southeast Asia. The video player of the archive is equipped with a Notepad in which users can enter their comments on a specific moment of the video. Any user may respond to these comments through the Notepad, thus generating virtual online discussion. The project is planning to extend the capacity and flexibility of TMA as an online collaborative platform and to equip the archive with user tools to maximize the creative potential of digital archives. 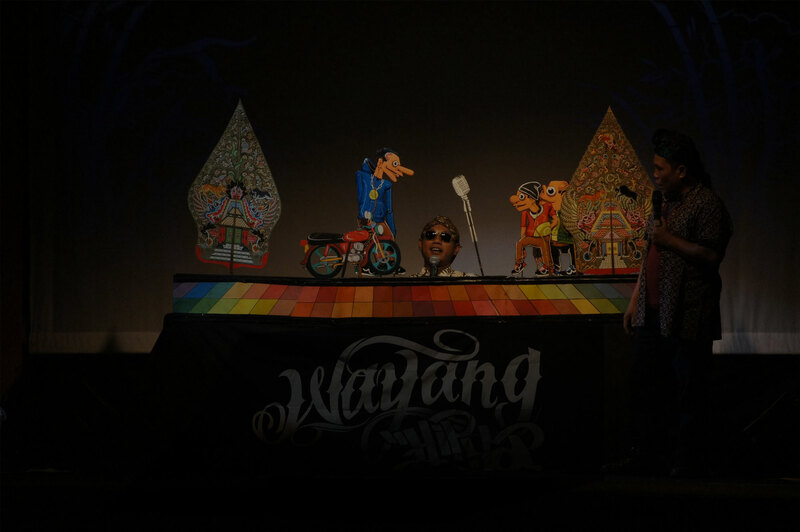 Contemporary Wayang Archive (CWA) adalah kumpulan pertunjukan-pertunjukan baru dari wayang kontemporer sebagai reinterpretasi dari tradisi wayang kulit purwa. Arsip ini termasuk informasi pertunjukan, terjemahan, serta catatan-catatan oleh editor dan penterjemah mengenai bagaimana pertunjukan diterima di dalam konteks aslinya. 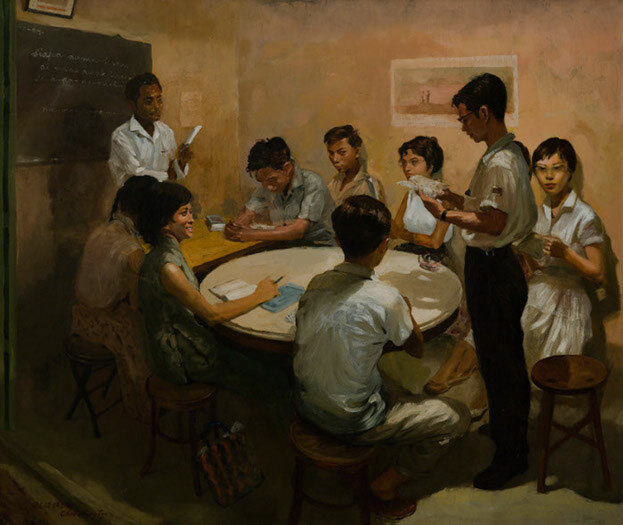 First conceived in 2005, National Language Class by spell#7 is an interactive performance about language and identity created in response to an iconic Singapore painting from 1959. 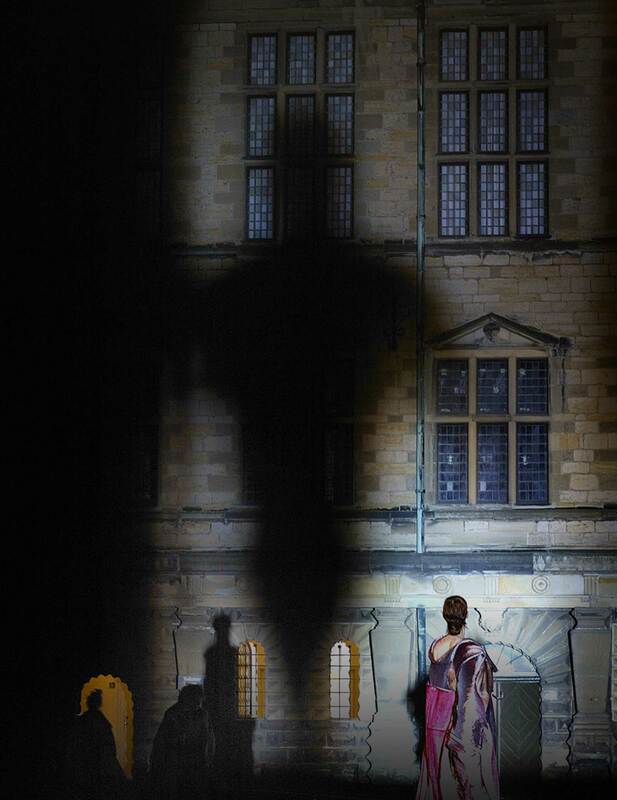 Over the years, the work has been presented in many forms including theatre shows, installations and roving performances. 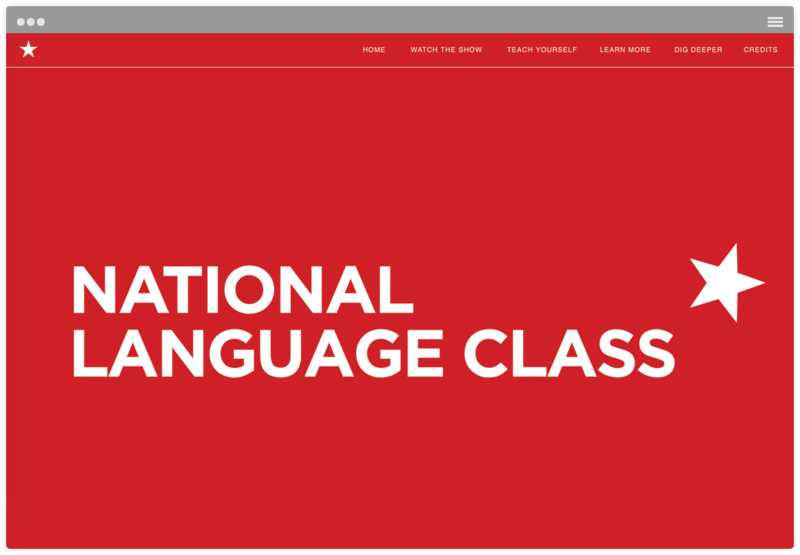 The extensive online National Language Class archive includes videos of the performances and plenty of extras providing additional context and information. Digital records of artistic practices (recordings, prints, motion capture data, and 3-D models) enable people around the world to access information about a wide array of artistic practices that originate in different cultural contexts. Through online archives, collections and scholarly editions, an increasing number of people are able to explore records of artistic practices not readily available through other means. This is important for teaching, preserving and studying a variety of culture-specific artistic practices that are often under-represented in international scholarship. This workshop aims to produce a reflexive overview of the key mechanisms through which the makers of digital collections introduce general audiences to the cultural specificity of their collections. 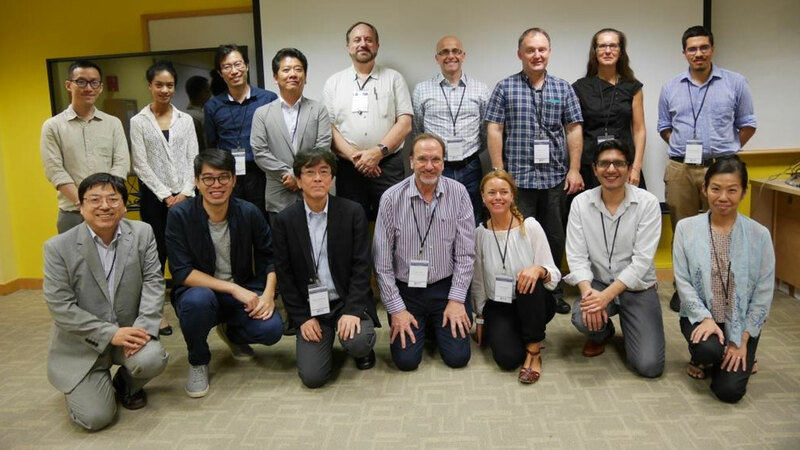 In this workshop, leading researchers in the area of digital archiving were invited to consider the question: what kinds of contextual materials are required in digital collections and what are the best technical tools to communicate these contextual materials? This workshop was a collaboration between the AIDA platform and Miguel Escobar Varela (grant number FY2015-FRC3-004). •	Miguel ESCOBAR VARELA. “Intermedial Scholarship." In The Routledge Companion to Digital Humanities in Theatre Research, ed. Nic Leonhardt (forthcoming from Routledge, 2017). •	Miguel ESCOBAR VARELA. “From Copper-Plate Inscriptions to Interactive Websites: Documenting Javanese Wayang Theatre.” In Documenting Performance: The Context and Processes of Digital Curation and Archiving, ed. Toni Sant (forthcoming from Bloomsbury, 2017). •	Alvin LIM Eng Hui. “Archiving Shakespeare and Thinking Virtually in a Distracted Globe.” In Documenting Performance: The Context and Processes of Digital Curation and Archiving, ed. Toni Sant (forthcoming from Bloomsbury, 2017). •	YONG Li Lan and Eleine NG. “Creating Data for A|S|I|A.” In The Routledge Companion to Digital Humanities in Theatre Research, ed. Nic Leonhardt (forthcoming from Routledge, 2017). •	Miguel ESCOBAR VARELA. “The Archive as Repertoire: Transience and Sustainability in Digital Archives.” Digital Humanities Quarterly (forthcoming 2016). •	Miguel ESCOBAR VARELA and Gea Oswah Fatah Parikesit. “A Quantitative Close Analysis of a Theatre Video Recording.” Digital Scholarship in the Humanities (forthcoming 2016, published online 5 February 2016 http://dsh.oxfordjournals.org/content/early/2016/02/04/llc.fqv069). •	Alvin LIM Eng Hui. “Digital Environments for Intercultural Content: A Case Study on the Asian Shakespeare Intercultural Archive.” In Digital Echoes: Spaces for Intangible and Performance-based Cultural Heritage, eds. Sarah Whatley, Rosamaria Kostic Cisneros, Amalia Sabiescu (forthcoming from Cambridge Scholars Publishing, 2017). •	Eleine NG. “Asian Shakespeare and the Intercultural Imperative.” PhD dissertation, University of Birmingham, 2016 (under examination). •	SUEMATSU Michiko. “Characteristic Use of Dramatic Texts in Modern Japanese Shakespeare Productions.” In The Oxford Handbook of Shakespeare and Performance, ed. James C. Bulman (forthcoming from Oxford University Press, 2016). •	TAKIGUCHI Ken. “Translating Erased History: Examining Inter-Asian Translation of National Changgeuk Company of Korea’s Romeo and Juliet.” Journal of World Languages, Special Issue: East and West Encounters: Translation across Time (forthcoming 2016). •	YONG Li Lan. “Interacting with Naturalism: East Asian Shakespeare Performances.” In The Shakespearean World, eds. Jill L. Levenson and Robert Ormsby (forthcoming from Routledge, 2016). •	YONG Li Lan. “Translating Performance: the Asian Shakespeare Intercultural Archive.” In The Oxford Handbook of Shakespeare and Performance, ed. James C. Bulman (forthcoming from Oxford University Press, 2016). •	Miguel ESCOBAR VARELA. “Heirlooms of the Everyday: The Material Performances of Slamet Gundono." Theatre Research International Vol. 41, No. 1 (2016): 53-69. •	Miguel ESCOBAR VARELA. “Hacking and Rehearsing, Experiments in Creative Tinkering.” New Theatre Quarterly Vol. 32, No. 1 (2016): 68-77. •	Miguel ESCOBAR VARELA. “Interoperable Performance Research: Promises and Perils of the Semantic Web.” TDR: The Drama Review Vol. 60, No. 3 (2016): 136-147. •	이현우 LEE Hyon-u. [Korean Shakespeare Renaissance]. 서울: 동인, 2016 [Seoul: Dongin, 2016]. •	SUEMATSU Michiko. “Intercultural theatre and Shakespeare: Japan.” In Routledge Handbook of Asian Theatre, ed. Siyuan Liu, 509-513. London and New York: Routledge, 2016. •	YONG Li Lan. “Southeast Asia: Contemporary Intercultural Productions of Shakespeare.” In Routledge Handbook of Asian Theatre, ed. Siyuan Liu, 517-526. London and New York: Routledge, 2016. •	Simon JONES and Paul RAE. “Commuting Performance → Working the Middle Ground.” In Performance and the Global City, eds. D.J. Hopkins and Kim Solga, 140-160. Houndmills: Palgrave Macmillan, 2015. •	이현우 LEE Hyon-u, transl. [Coriolanus]. 서울: 동인, 2015 [Seoul: Dongin, 2015]. •	이현우 LEE Hyon-u. “셰익스피어의 극 언어, 어떻게 한국화할 것인가?” [How to Koreanize Shakespeare's Dramatic Language]. Shakespeare Review Vol. 51, No. 1 (2015): 27-65. •	TAKIGUCHI Ken. “A Collective Invention: Locating Five Arts Centre in the Region.” In Staging History: Selected Plays from Five Arts Centre 1984–2014, ed. Kathy Roland. 14-21. Kuala Lumpur: Five Arts Centre, 2015. •	LEE Chee Keng and YONG Li Lan. “Ideology and student performances in China.” In Shakespeare on the University Stage, ed. Andrew James Hartley, 90-109. Cambridge: Cambridge University Press, 2014. •	Shreyosi MUKHERJEE. “(Dis) Locating Shakespeare: Mak Yong and A Midsummer Night’s Dream meet New Media Archive.” Shakespeare Review 50.5 (December 2014): 895-913. •	Eleine NG. “Intercultural Intersections in a Noh-style Hamlet: (Re)presentations of and Exchanges between Shakespeare and the Japanese Stage.” Shakespeare Review 50.5 (December 2014): 915-936. •	Eleine NG. “Performing Shakespeares: (dis)locating the authentic in a Korean intercultural Dream.” Shakespeare Vol. 10, Issue 4 (2014): 428-442. •	Paul RAE (Dir.) National Language Class. By spell#7. DVD performance documentation with subtitles, interviews, archival information and extra features. (Singapore: Akanga Productions Asia, 2014). •	LEE Hyon-u. “Gut (Korean shamanic ritual) and Korean Shakespeare” (in Korean). Shakespeare Review Vol. 49. No. 2 (2013). •	Simon JONES, Sara GIDDENS and Paul RAE (Dirs.) Dream→Work / Dream→Home. By Bodies in Flight and spell#7. DVD performance documentation with optional directors’ commentaries. (Singapore: Akanga Productions Asia, 2013). •	TAKIGUCHI Ken. “Translating Canons: Shakespeare on the Noh stage.” Shakespeare Vol. 9, Issue 4 (2013): 448-461. •	YONG Li Lan. “Tang Shu-wing's Titus and the acting of violence.” In Shakespeare Beyond English: A Global Experiment, eds. Susan Bennett and Christie Carson, 115-120. Cambridge: Cambridge University Press, 2013. •	YONG Li Lan. “Intercultural rhythm in Yohangza's Dream.” In Shakespeare Beyond English: A Global Experiment, eds. Susan Bennett and Christie Carson, 87-91. Cambridge: Cambridge University Press, 2013. •	Paul RAE. “Pigs Might Fly: Dance in the Time of Swine Flu.” Theatre Journal 63 (2011): 403-24. •	Paul RAE. “Wayang Studies?” In The Rise of Performance Studies: Rethinking Richard Schechner's Broad Spectrum Approach, eds. James Harding and Cindy Rosenthal, 67-84. Houndmills: Palgrave Macmillan, 2011. •	Paul RAE. “In Tongues: Translation, Embodiment, Performance.” In Translation in Asia: Theories, Practices, Histories, eds. Jan Van Der Putten and Ronit Ricci, 153-166. Manchester: St Jerome Publishing, 2011. •	YONG Li Lan. “Of Spirits and Sundry Other Phenomena in Intercultural Shakespeare: Text and Performance.” Anglistica 15.2 (2011), Shakespeare in the Media: Old and New. •	SUEMATSU Michiko and KOBAYASHI Kaori. “Asian Shakespeare Intercultural Archive (A-S-I-A): A Collaborative Digital Project.” Shakespeare Review Vol 45, No.1 (2010): 23-34. •	YONG Li Lan. “After Translation.” Shakespeare Survey 62 (2009): 283-295. •	KOBAYASHI Kaori. “From Drama to Ritual—Ryutopia's Winter's Tale—Barcarolle.” Shakespeare Studies 46 (2008): 93-97.